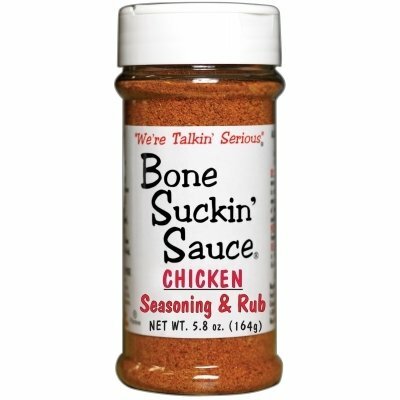 Bone Suckin’® Seasoning & Rub, Chicken 5.8 oz. Bone Suckin' Seasoning & Rub, CHICKEN 5.8 oz. - A lighter blend of the brown sugar, paprika and spices found in the Original Seasoning & Rub, garlic and sage come to the forefront of our poultry blend. While it’s perfect on chicken, turkey, and fish, like our other seasoning & rub products, it’s versatile enough to be used on just about anything. "Our customers have told us that our Original Seasoning & Rub is great on everything. But we wanted to offer them something a little bit different as the perfect complement to their poultry dishes," said Patrick Ford, vice president of Ford's Gourmet Foods. "With just the right mix of some of the Original flavors and the added hint of garlic and sage, we believe we have an outstanding product that will really enhance the flavor of turkey, chicken, fish and much more." “Normally, we like to season recipes with our own blends. However, a new poultry rub caught our tastebuds recently when we roasted a pastured chicken with Bone Suckin’ Seasoning and Rub for poultry. The Ford’s family recipe for the seasoning is flavorful, without being overpowering. It tastes bright and natural… I Love It!” - Fred Thompson, Chef & Managing Editor, Edible Piedmont.